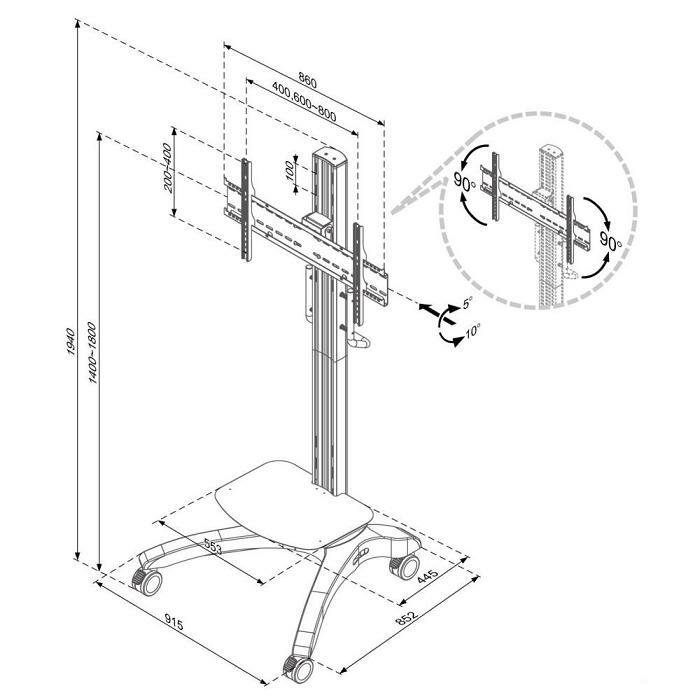 Home Ergonomic Products Mobile Carts / Workstations Adjustable Ergonomic Mobile TV Cart For 42" - 65"
Height adjustable equipment shelf is easy to clean with its smooth surface. 21.8¡± (L) x 17.5¡± (W) (55.3cm x 44.5cm) size allows accommodation for various equipments. You may usually find mounting patterns dimensions on the technical drawing page of your owner¡¯s manual. Otherwise you can simply measure from the center of one hole to the center of the next (both vertical and horizontal). Please remember to convert to millimeters (1 inch = 25.4 millimeters): 100mm = 3.94 inches; 200 mm = 7.87 inches; 300mm = 11.8 inches; 400 mm = 15.7 inches. Our new Adjustable Ergonomic Mobile TV Cart For 42" - 65" is a perfect solution to all your digital display and presentation needs. The rolling TV cart is Ideal for safely and securely moving flat panel displays up to 65¡±, with universal or VESA mounting pattern up to 800x400. The moveable TV stand has 76.4¡± (194cm) overall height and it¡¯s fully mobile with 4 heavy duty lockable casters. Handle design makes mobility much easier and smoother. This flat panel TV stand is made of steel and aluminum, featuring weight capacity of 176 lbs (80 kgs), portrait-to-landscape rotation, 5° to -10° screen tilt. An equipment shelf is included for anything from laptop, DVD player, to projector etc. with weight capacity of 33 lbs (15 kgs). 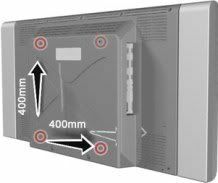 Height adjustments range 55¡± ¨C 70.8¡± (140 ¨C 180 cm) from ground to screen center, and 12.6¡± ¨C 24.4¡± (32 ¨C 62cm) from ground to shelf. Integrated cable management along the pole with plastic cover completes a neat installation. It's ergonomic, portable, space saving attributes and contemporary look make the media cart an attractive choice in all types of conferences, exhibitions, businesses, office, mall kiosks, retail stores, factories, band, schools, hospital, internet cage and even for home entertainment.